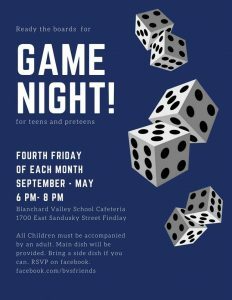 Blanchard Valley Center, 1700 E. Sandusky St.
Join us for a night of fun and games! Teens and preteens welcome. Main dish will be provided. Please bring a drink, chips, or dessert to share if you can. RSVP at https://goo.gl/xwwtzM *All Children must be accompanied by an adult. Our events are designed specifically for children with developmental differences and open to all children to promote an inclusive community.